CINCINNATI, Ohio — A usually busy Fountain Square was empty Thursday afternoon, except for a single piece of yellow tape. Down the street, a woman screamed and sobbed into the arms of a Cincinnati police officer. About an hour earlier, a Fifth Third Bank employee said he saw a gunman dressed in business attire walk into the lobby and spray bullets at innocent people. The employee saw the gunman as he exited a lobby elevator. He jumped back inside, narrowly avoiding a hail of bullets -- he heard them strike the elevator door when it closed. 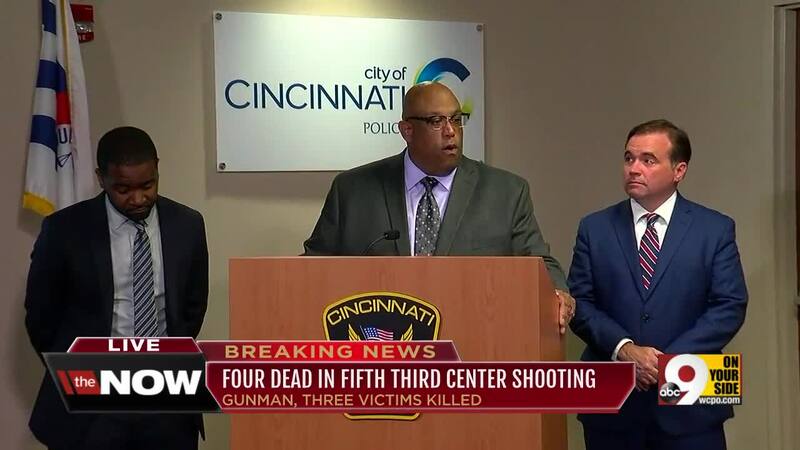 Three to four Cincinnati police officers exchanged fire with the gunman, Chief Eliot Isaac said. One of the officers shot and killed the gunman, Mayor John Cranley said. Pruthvi Raj Kandepi, 25; Richard Newcomer, 64; and Luis Felipe Calderón, 48, were shot and killed by 29-year-old Omar Santa-Perez. Another two people were injured. The shooting was the first to happen Downtown in 2018. Richard Newcomer, an employee of Gilbane Building Company in Rhode Island, was one of the three people killed in the shooting, his employer confirmed. Newcomer, 64, had been assigned to a project on the third floor of the Fifth Third Center. One of the surviving victims is in critical condition; the other victim is in fair condition. The shooter entered the loading dock area of Fifth Third Bank headquarters and opened fire at about 9 a.m., Isaac said. 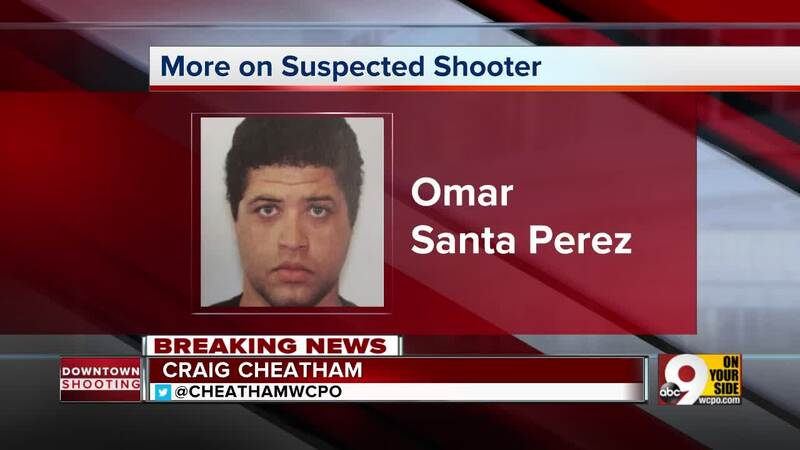 The suspect then entered the lobby area, where he shot at people and police officers. No police officers were injured. The two people who were shot were transported to the University of Cincinnati Medical Center. Isaac said at least one of the victims died on scene. There is no information yet about how many shots the gunman and officers fired, he said. The gunman's weapon was recovered from the scene. Hamilton County Prosecutor Joe Deters said the gunman fired multiple rounds from a handgun. Cranley said officers responded “within seconds” of the shooting. Isaac said it appears officials at Fifth Third Bank properly responded with lockdown procedures. "These are things we see happening across the country, and we all have to be vigilant and prepared to deal with these situations," Isaac said. Alcohol, Tobacco and Firearms officials were on scene to sweep the building, ATF spokesperson Suzanne Dabkowski said. Fountain Square is closed to foot traffic, and all events are canceled. Fifth Third Bank headquarters is a 30-story building that towers over Walnut Street. Isaac said investigators will conduct interviews, process the crime scene and review security and body camera footage in the coming days. The last fatal shooting reported in the Central Business District involved a single victim and occurred on July 7, 2014, according to the city's open data portal. The shooting took place on 8th Street and Garfield Place right outside the main branch of the Cincinnati library.